More than 200 police officers, staff and volunteers attended the Essex Police Awards 2016 to honour their efforts to protect and serve the people of Essex. They were nominated for a variety of awards and trophies. The winners were chosen from a list of inspiring stories of bravery, examples of excellent customer service and incidents where victims were helped above and beyond the call of duty. Developing and valuing police officers and staff and enhancing professionalism. Chief Constable Stephen Kavanagh, who presented the awards on Tuesday, October 11, said: “It is humbling and inspiring to hear stories of how dedicated and committed our officers, members of police staff and volunteers are to the people of Essex. 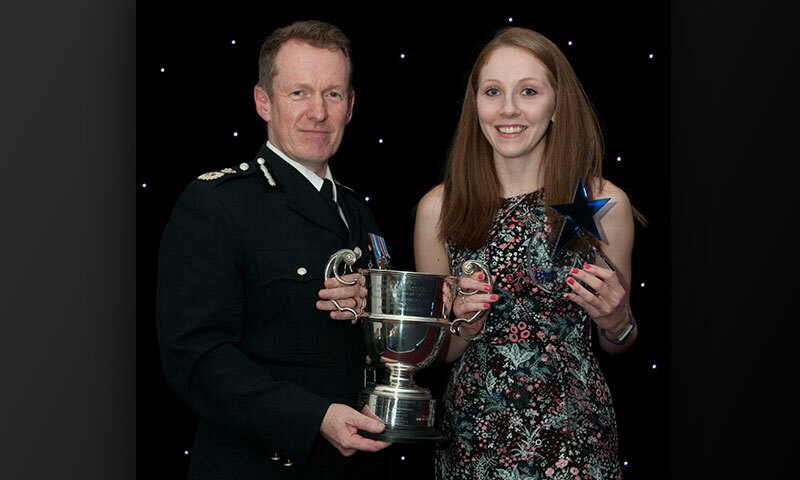 A long-standing traditional award which is presented to an outstanding student officer. Selection for the award is based on the various feedback Essex Police College receives from the Local Policing Area teams, assessors and tutors working alongside the student officers. It was first presented in October 1959 by Alderman W. J. Bennett, then chairman of Essex County Council. Winner: Pc Amye Rowham, based in the Chelmsford Local Policing Team, joined Essex Police in January 2015 and has quickly made her mark. She has been praised for her hard work and commitment, and very early on proved she could work independently with minimal supervision. Awarded to the highest placed officer in the promotion exams. It was donated in December 1962 by Sir Jonathan Peel on his retirement as Chief Constable of Essex Police. Winner: Ds Nathan Munson (Pictured in the middle is Ds Nathan Munson with Richard Peel, the grandson of Sir Jonathan Peel, on the right), who is currently on secondment with the Home Office. Awarded to a police officer or member of police staff who has shown personal commitment to promoting equality and diversity in the workplace and improving the confidence of diverse communities. Winner: Nikki Geaves (Pictured on the left is Sgt Gina Denham, with Nikki Geaves (middle) and Chief Constable Stephen Kavanagh), equality and diversity co-ordinator based at Chelmsford headquarters, was nominated for her commitment in supporting transgender police officers and staff within Essex Police. She was nominated by Sgt Gina Denham, of Basildon Community Policing Team, who said Nikki gave her the confidence and support she needed as she prepared for and underwent gender reassignment surgery. This included using innovation and creativity to problem-solve, such as providing Sgt Denham with two warrant cards so that she had appropriate identification whilst presenting as a woman off duty and still presenting as a male officer on duty. Sgt Denham said this made a big and meaningful difference to her. Winner: Special Inspector Mark Fenton, based in Tendring, supervises a team of 22 Specials who work alongside the community policing team. Mark instigated an ongoing operation dedicated to locating criminals and vulnerable young people caught up in organised gang activity who travel into the district. Working with partners such as British Transport Police and Abellio Greater Anglia, this has enabled vulnerable young people travelling to the area to be identified and given appropriate support while criminals are stopped and dealt with for drugs offences. Presented in recognition of an officer’s contribution to social services in the community or to police and public relations. Winner: Sgt Allen Burridge, based in the Basildon Local Community Policing Team, has been recognised for his outstanding commitment, dedication, and hard work. He has continued building on the team’s work with partner organisations and other agencies to tackle crime and anti-social behaviour and forged strong relationships within the community. Delivering strong local policing, working to earn the trust of the public, his hard work, commitment and dedication has been outstanding. Winner: PCSO Janis Nelson, based in the Castle Point and Rochford Community Policing Team, consistently demonstrates dedication, tenacity and an appetite for hard work. This has led to reductions in crime and anti-social behaviour and she has forged good relationships with the local community, particularly in the Thorney Bay area where she runs the police office. She also willingly takes on extra responsibility and was described by her nominator as an outstanding and committed PCSO. Awarded in recognition of commendable or meritorious achievement in the field of crime reduction. It was donated by Anthony Peel, who was Chair of the Essex Police Authority and the son of Sir Jonathan. Winner: Pc Marek Jaworski (Julia Peel, widow of the late Anthony Peel, is pictured on the left with Pc Marek Jaworski in the middle), based in the Basildon Community Policing Team, has forged strong relationships with the local community – residents know him by name. He has shown a real passion for his work and the area in which he serves, never shies away from the challenge and, earlier this year, he was chosen to help spearhead the launch of the town’s new community policing team. Winner: Jasmine Draper, a member of the Colchester Volunteer Police Cadet Unit, was at her father’s home in Ipswich when a motorcyclist, suspected of drink-driving, was involved in a collision with two pedestrians. He fell off of his motorbike but then got up and was aggressive towards the pedestrians. He then staggered away from the scene. Jasmine immediately asked her dad to call Suffolk Police. She then waited with the pedestrians to reassure and calm them until the ambulance arrived. During this incident she showed what it means to be a police cadet, handling a very stressful situation with calmness, level-headedness and with a thoughtless devotion towards the public and those in need. Members of the public were asked to nominate police officers, members of police staff or Specials they felt deserved recognition for dedication to the community they serve, for bravery or for going that extra mile to do something really special. This award acknowledges a piece of work or an approach which actively recognises vulnerability and has provided support and help where it is desperately needed. Winner: Sgt Janet Bloomfield. Sgt Bloomfield has 29 years’ service with Essex Police and has been directly involved with our work with children and young people for the past 16 years. She has provided support to police colleagues as well as to partner agencies – such as councils, housing providers, school staff and youth offending teams – as an advisor on issues involving children and young people and anti-social behaviour. She has promoted the ethos of not criminalising children and young people and finding the right solution for problems. She works towards reaching long-term resolutions for vulnerable victims, whether they be repeat victims of anti-social behaviour, or young people subjected to bullying. She believes in justice for victims, protecting the vulnerable and allowing children to make mistakes without those mistakes affecting them for the rest of their lives. The Team of the Year award recognises teams which pull together in adversity and deliver more than the sum of their parts. Winner: The Police OnLine Investigation Team (Ds Ian Collins is pictured in the middle and Dc Tony Miller is on the right.). The police officers and staff within POLIT lead our response to targeting those who prey on the vulnerable, those who commit horrendous crimes against children and those who share and watch that abuse online. The team’s role is emotionally and psychologically draining, with officers and staff daily exposed to the worst images of abuse. The team has had a number of significant results this year, with high-profile charges and convictions of individuals in positions of power over children. Their work stops ongoing abuse and prevents further children from becoming victims.